Who’s winning the messenger app wars? We now spend more time in messenger apps than we do on social media. It’s reported that over 2.5 billion people have at least one messaging app installed. By 2018, Activate Forecasts that number to grow to 3.6 billion people. In this article, we examine the most popular messaging apps, providing the latest data on usage and demographics. We also give an overview of the app’s features and it’s suitability as a platform upon which to develop chatbots. In 2016, an estimated 50.5% of UK residents (33.2 million users) will log on to Facebook each month. 50.3% of Americans of all ages will be on Facebook at least once a month, up from 49.3% in 2015. Globally it is the most popular social network with 1.65 billion users of which 566 million users are in Asia Pacific. In it’s second quarter 2016 earnings Facebook reported that it now has 1.57 billion monthly active users. It was also reported that it has 1.13 billion daily active users. It was recently reported that Facebook Messenger now has 1 billion active users. Messenger added 100 million new users in the last three months and about the same for the period January 2016 to March 2016, indicating fairly steady growth. In it’s first quarter earnings report Facebook announced that on average its users spend about 50 minutes per day across it’s apps (Facebook, Instagram and Facebook Messenger). At first glance this may not seem like a lot, but consider that there are only 24 hours in a day and the average person sleeps about 8.8 hours per day. Facebook Messenger was first launched in August 2011. In April 2014 it was announced that the messaging functionality will be completely removed from Facebook and users will be forced to download Messenger. Although users were unhappy about this at the time, it doesn’t seem to have slowed down the app’s growth. Originally released to enable users to easily reach friends wherever they are the app has added a host of features to extend its use from purely social to a lifestyle app. In 2015 a stack of new features were introduced meaning users spend even more time in the app: send & receive money, virtual business cards, transportation platform, business on messenger, message requests and M to name a few. In April 2016 Facebook announced the launch of its bot platform for Messenger. In the first three months since the launch, more than 11,000 bots have been built. WhatsApp is an instant messaging platform for smartphones and desktop. Users can send text messages, documents, images, video, user location and audio messages to other users. Users can also make VoIP calls using the platform. It was founded in 2009 and was acquired by Facebook in February 2014. In February 2016, WhatsApp reported that it had a user base of 1 billion. It is used in 109 countries, or 55.6% of the world, and supports more than 50 languages. WhatsApp has been slow to open itself up to businesses. In January 2016 it announced that it will start testing tools this year to allow its users to communicate directly with businesses and organisations. This is likely to mean that WhatsApp becomes a viable platform to build bots for towards the end of 2016. Skype was first released in August 2003 and acquired by Microsoft in May 2011. It allows users to communicate over the internet using voice, video and instant messaging. Users can also exchange files and share their screen with with other users. In April 2016 it was reported to have 300 million active users. Skype is used globally for social and business communication, as well as initiatives like Skype in the classroom (launched in 2009) which has over 1.5 million educators from around the world bringing real-life learning to over 6 million students. At the end of 2015 Skype reported that its users spent 3 billion minutes on Skype calls each day. Microsoft is turning Skype into a messaging bot platform. In March 2016, it introduced the Skype Bot Program, a set of tools that lets developers build bots for Skype. Kik Messenger is a messaging platform modelled after Blackberry Messenger and used for social private and group messaging. It is known for its features which preserve users’ anonymity. In February 2016 it was reported to have 275 million users and in August 2015 it was reported that it was used by approximately 40% of United States teenagers use it. Kik reported in January 2015 that users spend 35 minutes per session in the app, ahead of Facebook Messenger (27 minutes) and Snapchat (21 minutes) at the time. “The average U.S. teen on Kik engages in 6.1 chat sessions a day at, 12.7 minutes per chat session. U.S. teen females on Kik chat 35% longer than U.S. teen males. U.S. teen “super users” (who make up 10% of Kik’s user base) engage in 10 chat sessions a day on average, accounting for 157 minutes of daily chatting. Kik users are more engaged in active chat during the week, but they have more chat sessions during the weekend. Kik Messenger was one of the first pioneers of chat bots. They released their own platform for making chatbots back in April 2016. Since then it’s estimated that more than 6,000 bots have been created for the app. Slack is a cloud-based team collaboration tool that was launched in August 2013. Originally a messaging / chatroom tool, it has steadily extended functionality by adding and supporting integrations with third party products like Google Drive, Trello, Zendesk etc. In January 2015 it announced the acquisition of Screenhero, which will be integrated to add voice, video and screen sharing. In its May 2016 customer update it announced that it now has 3 million daily active users, two million of which are connected at any one time. It also now boasts 930,000 paid accounts. The average user spends a staggering 10 hours per weekday plugged into Slack. In December 2015 Slack (in association with Howdy) announced the release of new software, Botkit, to simplify building slack apps; a directory to make it easier to find these apps; and a $80 million investment fund to back developers of these apps. As of July 2016, the directory has more than 600 apps listed. Telegram is a cloud-based instant messaging platform that can be used on mobile and desktop systems. It’s users can send messages and exchange photos, videos, stickers and files of any type. It was launched in 2013 in Russia and in February 2016 it announced that is had 100 million monthly active users with 35,000 new users signing up each day. Telegram doesn’t collect user data and so not much is known about its user demographics. Business of Apps reported in January 2016 that its users are most interested in money transfer features on their mobile messaging apps. Telegram is used by individuals and businesses. It focuses on speed and security, can be used on multiple devices at the same time and has stated that it will remain free for ever. It also supports group chats with up to 5000 members per group. In June 2015 Telegram announced a Bot API and platform for third party developers to create bots. In April 2016 it announced Bots 2.0, a new iteration of its bot platform with stacks of new features such as inline keyboards, callback and URL buttons, location permissions and on-the-fly message editing. LINE is a social messaging platform and was launched in Japan in 2011 and became Japan’s largest social network in 2013. It reached the 200 million user mark within 24 months. It’s estimated to have more than 600 million users with 218 million active global users. In Japan, more than 90% of users using messaging apps use LINE. It’s almost as high for Thailand, Indonesia and Taiwan. Contrast that to the estimated 12% of messaging app users that are active on LINE in the United States. LINE has launched new services like Line Pay in a continued push to turn its messaging app into a lifestyle platform. In March 2016 it announced plans for the strategic opening of the business platform on its communication app in order to make the wide variety of services provided by businesses over LINE easier to use. In April 2016 LINE started provisioning free bot API trial accounts ahead of its plans to open up access to its messaging API later this year. WeChat is an instant messaging service developed in China and first released in January 2011. In May 2016 it was announced that it had 762 million monthly active users. In October 2015 it was reported that approximately 93% of people living in Tier 1 cities in China were registered WeChat users with about 60% of users between 15–29 years old. WeChat was the first platform to offer users access to a broad array of features, such as peer-to-peer payments and city services such as the ability to order a cab or make a doctor’s appointment. It’s bot program, called “public accounts”, is extremely successful. It enables users to push feeds directly to subscribers, interact with them and provide them with services. Public accounts have become a common service and promotion platform for news media, companies and even government. By May 2010 it is reported that the number of public accounts had reached 10 million. In February 2015 Viber was reported to have 236 million monthly active users. As of the third quarter 2015 the global average adoption rate of Viber was 8%, with Vietnam, Philippines and Ireland coming it top at 29%, 27% and 23% respectively. Viber for Business offers different ways to engage with your users: promotional stickers, official public chats and service messages. Launched in March 2010, KakaoTalk (also known as KaTalk) is a free mobile instant messaging platform with free text and free call features. It is used by 93% of smartphone owners in South Korea. It is the top messenger app in South Korea. KakaoTalk has an estimated 170 million registered users and ~50 million monthly active users. It is available in 15 languages and used in over 230 countries. Information on time spent in app is limited, but back in November 2013 it was reported that users averaged 213 minutes with the app per week, more than any other mobile messaging app at the time. Although KakaoTalk began as a messenger platform, it has subsequently transformed itself into a platform for the distribution of various third party content and apps and services to ensure people spend more time in-app, including Kakao Talk Yellow ID, Daum News, Kakao Game, Kakao Taxi, Daum Real Estate and Kakao Pay. Services can be added using the KakaoTalk API (documentation written in Korean). 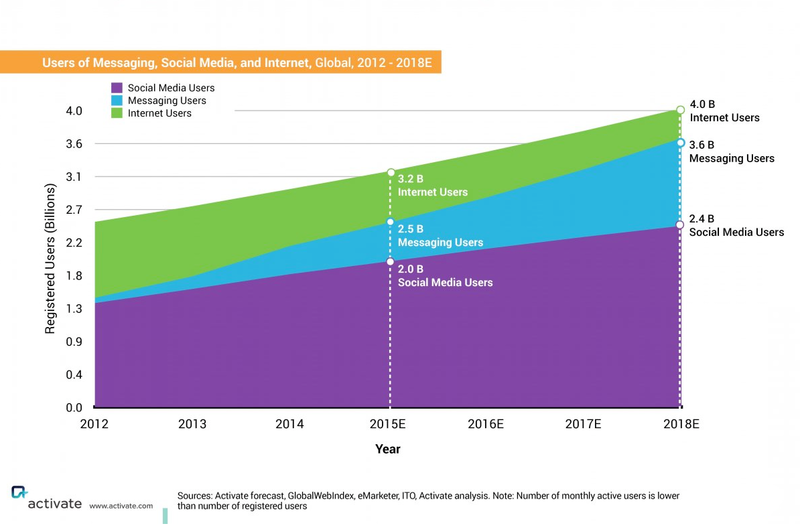 The number of people that have at least one messaging app installed is expected to grow to 3.6 billion by 2018. Put another way, that is a staggering 90% of the worlds internet enabled population or nearly half the estimated world population (7.56 billion)! It’s a huge audience pool and services based on AI and NLP technology are improving rapidly. With the very real effects of app fatigue being felt, chat-bots have become a very attractive option. Some are even asking whether chat-bots could be the fifth wave of internet communication? We believe that chatbots and messaging apps open up an important new channel to connect with users, but a good bot needs to satisfy all the traditional criteria of a good product or service. How do I choose the best bot platform? Know your audience. You can use the information in this article to short-list platforms that are popular with your audience but always spend some time using the apps as each has it’s own ideosyncracies. Atchai is currently developing a cross-platform bot development kit that will make it easy to switch on or off multiple different messaging platforms for your bot. Can you help me build a bot? Yes! We’re one of only a few companies that specialise in building chat bots. There are several bot-builder products out there. These products can create a very basic bots, and we recommend you try them out in case they are capable of building a first prototype. It’s likely that you will quickly run into limitations that require a custom bot to be built. Working with a professional chat-bot agency we will help you identify the right platform, design a conversation flow and write copy with consistent tone of voice, and deploy a robust and mature tech platform that will scale to millions of users and maek use of the latest NLP and AI techniques. Philip makes light work out of keeping projects on track, and clients happy. He excels at bridging the gap between user and technology. From the Discovery Phase, through research, delivery, and testing, Philip will be keeping the client well informed, and the delivery team motivated. 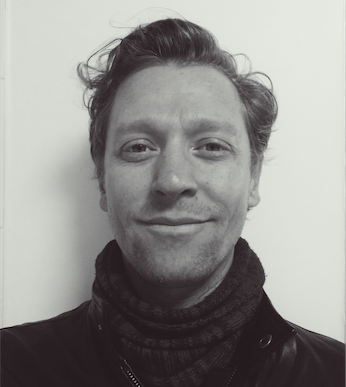 He’s a Certified ScrumMaster (CSM) but also brings with him a wide range of experience from working in the charity, legal, and film industries. He also cooks a mean barbecue.